Mechanical and Physical Testing of Biocomposites, Fibre-Reinforced Composites and Hybrid Composites covers key aspects of fracture and failure in natural/synthetic fiber reinforced polymer based composite materials, ranging from crack propagation, to crack growth, and from notch-size effect, to damage-tolerant design. Topics of interest include mechanical properties, such as tensile, flexural, compression, shear, impact, fracture toughness, low and high velocity impact, and anti-ballistic properties of natural fiber, synthetic fibers and hybrid composites materials. It also covers physical properties, such as density, water absorption, thickness swelling, and void content of composite materials fabricated from natural or synthetic materials. 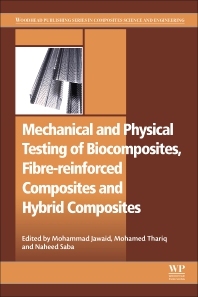 Written by leading experts in the field, and covering composite materials developed from different natural fibers and their hybridization with synthetic fibers, the book's chapters provide cutting-edge, up-to-date research on the characterization, analysis and modelling of composite materials. An excellent book in biopolymers, natural fibres and bio Composites. A must have in the shelf. Mohamed Thariq is a Professional Engineer registered under the Board of Engineers Malaysia (BEM), and is currently attached to the Universiti Putra Malaysia as Director / Head of Aerospace Manufacturing Research Centre (AMRC), Faculty of Engineering, UPM Serdang, Selangor, Malaysia. Being a Director / Head of AMRC; he is also an Independent Scientific Advisor to the Aerospace Malaysia Innovation Centre (AMIC) based in Cyberjaya, Selangor, Malaysia. He received his Ph.D. from the University of Sheffield, United Kingdom. He has about 10 years of experience in teaching and research. His area of research includes Hybrid Composites, Advance Materials, Structural Health Monitoring and Impact Studies. He is also the Deputy President of Malaysian Society of Structural Health Monitoring (MSSHM) based in UPM Serdang, Selangor, Malaysia.